The print is printed on textured bright white photo paper with fade resistant inks. They are also available as giclee prints on heavy fine art paper. Please enquire about the costs if you would prefer a giclee print. Sometimes there are paintings inside of me waiting in cue for their turn to be painted. I find it a frustration when this is the case and I have to wait often years before it is that towns turn. But when the turn finally comes, it’s the best feeling. That is the case with these Napier paintings painted for my 2008 exhibition. 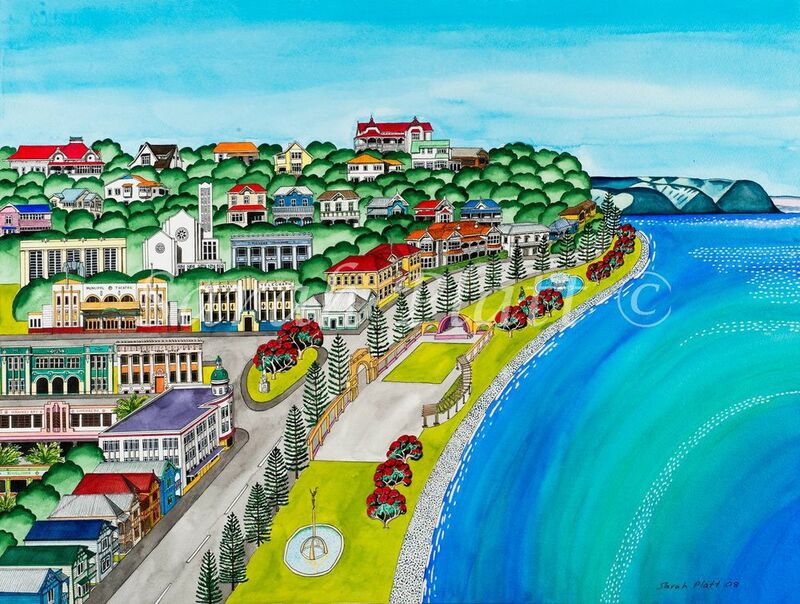 The city charmed me for many years with its bright sea side colours and its Art Deco and colonial charm. Driving over from the Manawatu each year on our way up to the East Coast, Napier is always our first stop and our first glimpse and smell of the freshness of the sea. This image captures it for me. It’s one of my favorites. Yes I know I’ve turned the sound shell around, but I wanted to be able to see inside it, so it had to be done. I research a lot about a place when I’m painting it, so of course I ended up reading lots of personal stories told by earthquake survivors. It made me think a lot about our ability as communities to rebuild things when everything goes pair shaped. Napier is a desirable destination for its Art Deco and its sea side charm, but I think it’s appeal is deeper than that. It is it’s story of peoples enduring ability to rise up and rebuild and restore that is the inspiration that speaks to us. This one is the same image as NAPIER 1 but in water colour. Drawing a design up on canvas is too tricky for me so I usually work one out on paper first, and sometimes ink and paint that one up to. The paint effects are so different the paintings end up looking quite different. This one has sat over our bed for the years since I painted it, and we really love it. It has charmed and delighted me. It is now available at the A&E Art Gallery in Napier.